what they believe the general public needs to know about the issue they addressed or the community they worked with. To prepare a Showcase Session presentation, it is important to keep in mind a few key aspects of the context of this portion of the Symposium. PUBLIC is the Journal of Imagining America, a professional association for public artists and scholars. This latest issue reflects on the efforts of university-community collaborations and shares critical writing and innovative projects that seek to transform the practices of incarceration. You can view it online now at public.imaginingamerica.org. The contributors to the issue explore the complexities of incarceration from lived experiences as incarcerated, formerly incarcerated, and system impacted people, and scholars, practitioners, and artists whose work addresses our carceral systems. 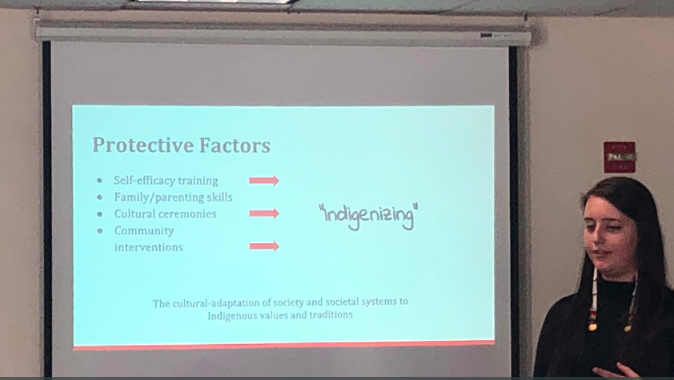 These pedagogical approaches and pedagogies are tied to groundbreaking research initiatives, detailing the potentials and challenges of bringing institutional, geographical, and demographic information to a public audience in an effort to raise questions that are too often not asked. New semester-new learning opportunities about the social determinants of health in DC! Check out the first four in a series of 8 mini podcasts from the Rodham Insititute https://anchor.fm/rodham-diana-hla about Health Equity in DC. They run about 7 minutes long and have interviews with various academic and community leaders on each of the Social Determinants of Health. About Campus is offering free downloads of top articles for a limited time-great opportunity for over the break reading-or to fill out reading lists for spring courses! Thank You for Making the Fall 2018 Symposium on Community Engaged Scholarship a Success! 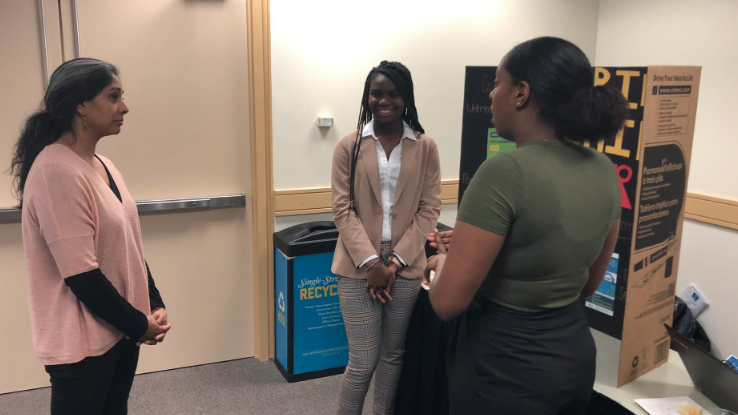 The Symposium was a success and we want to thank the students, faculty and community partners who spent the afternoon learning from and engaging with each other! Everyone learned a great deal from the presenters, Dr. Jacobsen’s Theater Students gave the audience a new way to think about immigration with their presentation, the showcases from community engaged courses highlighted the service, research, learning and action that students undertook throughout the semester and the concluding panels examined community engaged scholarship in depth- all great examples of engagement with our community and our scholarship. Do you have scholarship to share? Mark your calendar for the spring symposium on April 26, 2019! The Nashman Center welcomes students from Community-Engaged Courses who are participating in the Symposium today. To confirm your attendance with your professor, post your reflections on each session you attend to your GWServes course page (instructions below). 5) Post your reflections (prompts provided on the next page) and click submit. Your wall posts will be seen by your course instructor and that is how they will verify credit for attendance today. 6) Questions? From GWServes, message your course administrator, Rachel Talbert. Prompts for response: Please share a few thoughts about each of these sessions today. 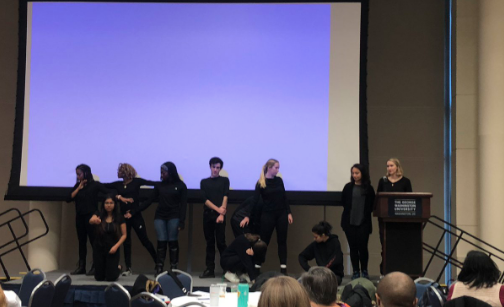 1) Lunch Session: After viewing the GW Theatre students’ presentation, what do you think about the role of the arts in social change? Has your service experience ever led you to also do advocacy? 2) Showcase Session: Which showcase presentation was your favorite and why? 3) Panel Session: Which session did you choose? 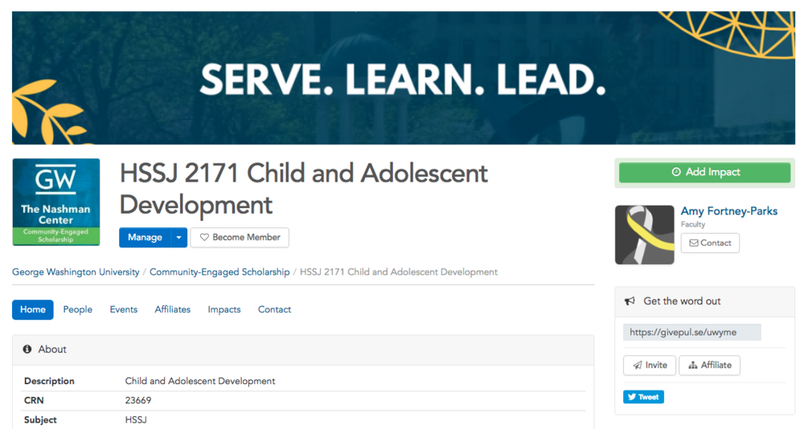 What was discussed that you can connect to what you learned in your community-engaged scholarship course this semester? As we near the end of another semester, our students often need help identifying their next steps, given the significant learning experience they have had. Below are a few suggestions to forward to them. Submit a proposal for funding to implement a new initiative that builds from their engagement and learning from your course. Several opportunities exist via the Honey W Nashman Center’s GW Upstart program. Students with relatively small projects can consider the Public Service Grant Commission. 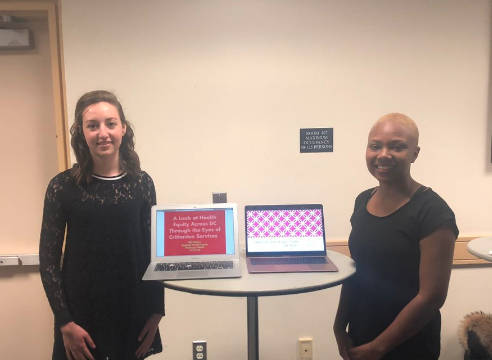 Students with larger-scale initiatives might consider the Eco-Equity Challenge, Projects for Peace, or the Knapp Fellowship for Entrepreneurial Service-Learning. 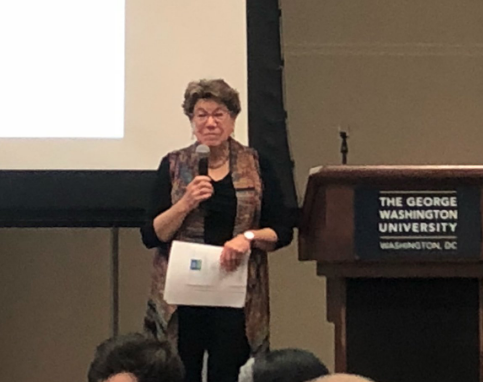 Present about their experience, both their own learning and their community impact, to the GW community at the Symposium on Community Engaged Scholarship. The event is Friday, December 7th, from noon-3:45. Students sign up to present via this link. Submit a paper to the International Undergraduate Journal for Service-learning, Leadership and Social Change. Accepted papers include project descriptions, case studies, and reflections. If students have written a piece that is about Washington, DC, encourage them to submit it to the University Writing Program's Julian Clement Chase prize. Please share these opportunities with students. 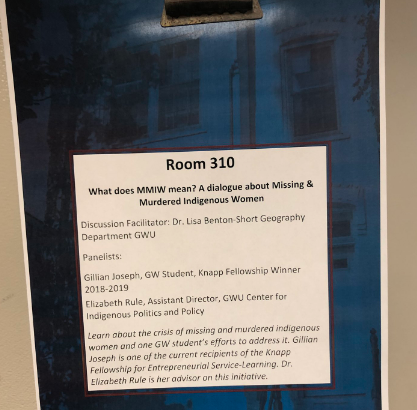 The November 14th, Conversation on Community-Engaged Scholarship was about gender-based harassment or assault in the context of service sites. Several faculty have recently had students express discomfort from experiencing unwanted attention while at their service-site. This Conversation was intended to be the first of many discussions about how to respond and how to proactively prepare students to feel more comfortable communicating their boundaries, particularly in the context of the service relationship.